A lengthy interview with Erik Hermansen of Caravel Games, the industry veteran who gave us the DROD series - recently featured on Kotaku's Five Indie Picks. 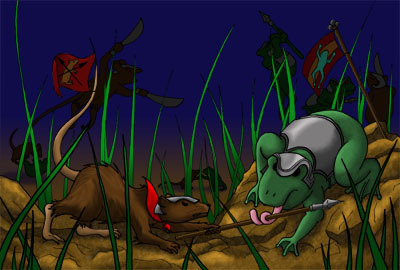 He is also currently working on Frogs and Mice, an exclusive game for InstantAction set to be released early next year. Alright, so I'm a guy that has made computer games for fun since I was 13. And then at one point I thought I'd try selling them. It more or less worked. 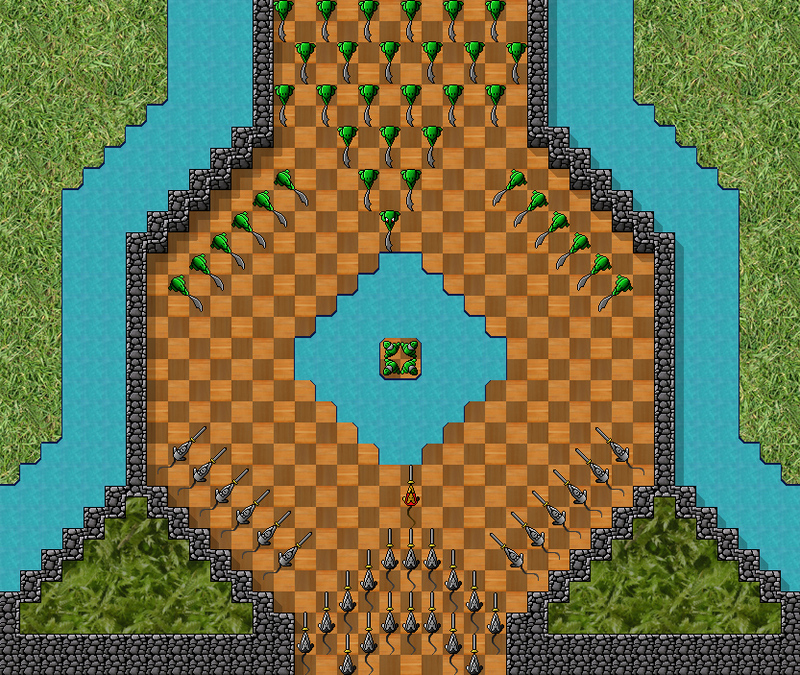 DROD was the game I made that was what I wished someone else would make so I could play it. And after I got it out to the world, I found out that there were a smallish number of people that really, really loved it. I think because they have brains like mine. How long has the DROD series been around? I've first heard about it from The Underdogs, and that site is long gone but Caravel Games is still here! Well, it gets really boring to explain the various ways you might determine how long it's been around. But I will say that I started designing early versions of it around 1992. And the first commercial version of it was... (leaving briefly to look it up) 1997. That was the version I published with Webfoot Technologies. Now we publish it all ourself. Who originally worked on the first DROD? If I remember correctly you started out with just one partner..
Well, there was just me and a guy named Lucas Swineford to begin with. Lucas made a bunch of levels for DROD, and I did most everything else. A guy named Lars K Aasbrenn wrote the music. Then as years went by, there've been maybe a dozen core contributors and several tens of people doing things like beta testing and voice acting. I honestly have a hard time explaining how DROD got made. It's really like a number of games in a series like Sims. "DROD" is more like a franchise name. Let me lock you in a room for four hours and bore you to death. THEN YOU WILL UNDERSTAND. Tie you to a wooden wheelchair and show you powerpoint slides. Where do you think your fans heard about DROD from? I would say The Underdogs mainly, but that's because I'm uninformed.. plus it was at a time when internet marketing was practically unheard of, and games are only promoted by word of mouth. Underdogs was a big one (thanks Sarinee!). And there's some obscure little budget CD that Webfoot got DROD onto a long while back that apparently was a big deal. But mainly they trickle in from different sources. And word of mouth is still really the biggest way people learn about it. We send out press releases sure, but people are getting their friends hooked on it and posting on forums. It used to be you threw a game up on a bunch of download sites and that was all the marketing you needed. Has that changed? Are you spending on marketing DROD: The City Beneath? Yeah, we are gearing up to do a lot more marketing in a more intelligent way. For instance, your name is going to go into a database and a little note is going to be put there that says we had this interview. And later on you're gonna get spammed! No, not spammed, respectfully contacted about other opportunities. :) NO SPAM. Seriously, I've got this long-time fan Matt Cramp, working on the marketing side on a regular basis and we are taking it very seriously. We don't want to offload our marketing work to other companies or publishers. I'm not going to ask about the number of emails in your mailing address, but how about an active forum members count? Just to find out an indication of the rabid fan base Caravel Games' have. Last time I checked it was something like 500 active members (logged in at some point in the last 3 months). About 1 in 3 people that buy our games also sign up for the accompanying online service too. It's not huge numbers, but it's a solid base of players that you can do things with. What do you think happened to the owner of The Underdogs? She sort of disappeared, or maybe lost interest in the whole thing.. I don't know what Sarinee is up to these days. I know that she's very talented and capable, and I think of her site as a great gift. People get busy, their interests change. The remarkable thing is that she has done so much on the site over such a long period. Five years in operation perhaps? I mean The Underdogs, before it went inactive. Well, the cool thing about Underdogs is that the policy was not the typical abandonware ethic of putting any old crap up you could get away with. Underdogs really did care about what the authors and copyrightholders wanted. It wasn't a big screw job to people making games. It was respectful of creative work. How many people do you think have completed every single DROD release? Not me, I can tell you that. I finished King Dugan's Dungeon, but not the last two. It's frigging hard! But I'd guess that the number is less than a hundred. Or maybe low hundreds. Well, I find myself resorting to using the online solutions very often. Yeah, the DROD design attracts these supergenius MENSA types that are used to solving really tough problems. And there's one camp that pulls the puzzles off into that supergenius territory. The other camp asks for easier puzzles, but is maybe underrepresented. Too hard for a lot of people. That's why I'm starting over with the new game. Frogs and Mice. Frogs and Mice (F&M) will be on GarageGames' InstantAction right? When will that be playable? Last I heard it was "early next year". Well, it's up to us (Caravel) and it's up to them. But I would guess around April of 2008. Yeah, I am pushing for a tight schedule on this one to make GarageGames happy, but the honest answer always has to be "we don't know". Of course, when does a game studio ever know, other than the month before release? And yeah, it will go on InstantAction exclusively. Which is different for us. We have stayed away from exclusive deals. But in this case we are keeping "DROD" games selling from our website, and then retheming DROD to be different so it can appear exclusively on InstantAction. So F&M is like little mice and frogs fighting each other. And DROD is about Beethro Budkin, a weird trollish guy chopping up roaches. But it is the same DROD style of gameplay. Will F&M be playable using any internet browser? Details about InstantAction are sketchy at best, and since you're working with GarageGames, perhaps you can tell us a little about their new game delivery platform, and how it's any different from other flash game portals. Sorry man, they might send nasty lawyers after me. I basically am limited to saying things off their press releases. They are way frigging serious about nondisclosure. I had Jeff Tunnel repeating it to me for a solid ten minutes on my last visit. Haha, alright. Best to avoid that legal mine field. :) So Frogs and Mice is essentially DROD then? With new sprites and backgrounds, but the same addictive puzzle elements - or is there something new that we might see done differently in this InstantAction exclusive. I mean, do we play the mice or the frog? And do they carry huge swords? It's kinda hard to imagine a Caravel Games' release without Beethro..
* Different and better graphics. I've got an artist sitting behind me drawing up cute little animals and nice animated sprites. She's been working on this solid for months. We're going to make the screen more interesting to look at. * The game will be oriented for the casual newcomer. Not stupid casual like "I won't play this game unless I can match colors together". This is for people that are willing to try a new kind of game as long as they can figure it out in the first 15 minutes. * There will be new game elements not seen in DROD before. We have an interesting "stealth" mode of play that hasn't been seen in DROD games before. That's the main stuff. I don't want to blind you with bullet points. Frogs and Mice - completely free to play? Will there be a story? How about voiceovers? I'm assuming there will be a shareware demo + registered portion. I'm not clear on the InstantAction payment model at this point. Yes, there will be limited story, but we want to keep the emphasis on puzzles for this game. There will be less story than what we had in DROD: The City Beneath. Voiceovers? Possibly. The problem is that since dialogue is sparser, it can be a little jarring to have characters talking suddenly amidst relative silence. We're going to play with it a bit to see what works. How large is Frogs and Mice in terms of content? Compared to DROD: The City Beneath (or any of it's predecessors). I think Frogs and Mice will play through faster than DROD: The City Beneath simply because it will be much easier. But the room count will be similar with a huge world to explore. And we'll include the level editor so people can publish their own level collections. To get through the core levels were aiming at 20-30 hours. After that there will be a LOT of replayabity from level editing, challenges, finding secrets, and high score competition. I expect the same "career" effect we have for DROD. People play the same damned game for years. Will you be posting more screenshots or trailers for Frogs and Mice? We've only seen small bits of it; some sprites and a couple of backgrounds (see gallery and animations) - so all our impressions are based on superimposing those images onto gameplay elements which we're familiar with from DROD. Sure, but we're not in a hurry to post screenshots since the cosmetic elements of the game are probably getting put in last. We've prioritized development to get level design and new game elements done first. So it will be months before the F&M screenshots start popping up. You have the FIRST interview related to Frogs and Mice. Feel proud? Feeling very privileged haha. Okay one last question: do you have a screenshot or any material from Frogs and Mice to share with your loyal DROD fans? Yeah, yeah, I'll dig something up for you. But this will delay development, you understand? If the game gets behind schedule, it's your fault. Alright... better not then heh. I was thinking about asking how Frogs and Mice got it's name, and your inspiration behind it. Dude, I already dropped so much new material on you. But let's see... Well, I will tell you that one of the characters you play is female, but as far as I can tell, there is no discernable way to know this from playing the game. So you can play Bread Nibbler (male) or Slice Snatcher (female). But they are both tiny little mice on the screen, so you just have to know that one is male and the other is female. See, a real bona-fide secret for you! Er... is that for print? Yeah, you can have that little gem. I'm a generous guy.